First of all thanks for the addon - been using it for years. Are there any plans to fix Method Dungeon Tools pull routes? the links in chat dont work. Recently when someone whispers me and I click on their name to respond, or I right click whisper someone from my battle net list, the chat doesn't pick up the right "channel". For example when I click someone's name in the chat, it goes into "Say" mode instead of "Whisper". Tried without the addon and it doesn't happen. Same here. or when i right click someone it doesnt open up the whisper, it opens up the last channel i wrote in. Why does Prat install all its libraries in a top-level addon folder, rather than in a subfolder under the Prat addon directory? did something recently change the default channel colours? I'm having a large amout on fps freeze / stutter when a wall of text is being posted in chat frame. Like multiple ppl getting achievements at the same time, dps meter reports, macros using multiple line of text etc etc. I can feel the stutter everytime its being posted. And it doenst happen with prat turned off.. so something in there is causing it. I don't think i'm the only one with the issue also. You're not the only one. Same issue here. Posting links is currently broken and it's been so for a while. This includes at least web addresses and links from addons such as Method Dungeon Tools. Opening links works just fine tho. Still can't move the combat log within 3/4" of the bottom of the screen. 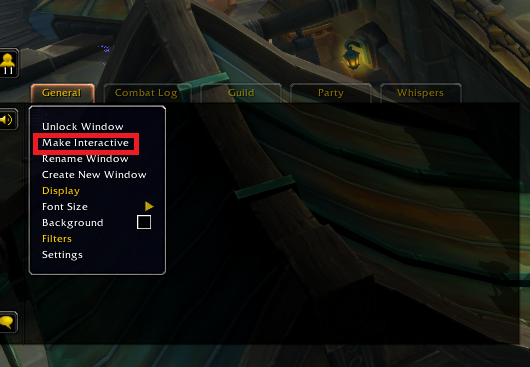 Hell, I just want to move it to rest on top of my Titan Panel bottom bar (like I could in Legion) but there is an invisible force field introduced in the BFA versions of this addon preventing me from doing so. When you try to right click on the name of anyone that has come online in guild, gained an achievement or on any name from the scrollback history. Please add the option to have tooltips for Archievments / Items, linkable elements at mouseover. Try right-clicking on your chat tab (like the General tab, for example) and click on "Make Interactive". That should solve your issue.